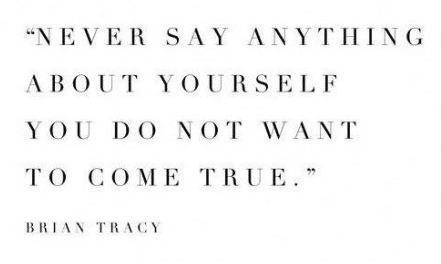 You’ve probably heard the saying that what you say to yourself, about yourself, when you’re by yourself, are the most powerful words you will ever say. They can also be the most dangerous. Your subconscious mind makes up around 90% of all your thought processes. Part of your subconscious mind, the Reticular Activating System (RAS), is a goal-striving mechanism. It doesn’t make judgements on what you say or think – it just searches for evidence that it’s true. For instance, you have probably heard people state their limitations as if they are proud of them. “I’m so bad at directions!” or “I’m always so clumsy!” As well as saying what they’ve experienced to be true, they are also training their subconscious to look for evidence that it’s true. Research has shown that at any one time we could potentially focus on 1 million bits of information all made available to us via our five senses. Our brain cannot cognitively handle that much information, so it filters out information that doesn’t fit with what we believe to be true. So if we believe that we are clumsy, it will hunt for evidence of that. If we believe we are bad with directions, that is the information it will grab onto, ignoring any evidence to the contrary. This plays out in business when we believe that we aren’t good at certain things. We may tell ourselves that we are not entrepreneurial, or that we are no good at business finances, or that we are a terrible manager. If you say it, your subconscious mind will show you that it’s true. There is a raft of scientific evidence to support that this works. If you are in any doubt, just try it for a week or two. Make statements that reflect how you want to be, and notice the change. Are you too impatient in business?